In the 50s, Morocco had its own beauty contest. The competition known as «Miss Maroc» allowed several Moroccan beauties to compete for international beauty pageants. Five months after Morocco broke free from the French, Lydia Marin was the first Miss Morocco to represent the North African Kingdom in Miss World, the oldest running international beauty pageant. Miss World’s archives list Lidya Marin as the first woman to compete under the name of Morocco next to several other ladies in 1956. The international competition, created in the United Kingdom by Eric Morley in 1951, was held on 15 October at the Lyceum Ballroom in London. During the beauty contest, Lidya presented herself as a 19-year-old secretary who speaks French and Arabic. On the 68-year-old competition’s website, the Moroccan beauty competitor described herself as a lady who «enjoys ready» and who «hopes to become an actress». Although, she was the first Miss Morocco to run for an international beauty pageant, Lidya was not able to make it to the top. Miss World 1956 was won by Germany’s Petra Schurmam. The following year, Morocco had another representative at Miss World, namely Danielle Muller. In 1958, Jocelyne Lambin participated to the competition under the Moroccan flag. The 21-year-old hairdresser did not go too far in the contest but did not miss the opportunity to point out that she «enjoys reading technical books and that hse is aspired to work in movies». In 1964, Leila Gourmala was the first Miss Morocco, with an Arabic name, to represent the Kingdom in Miss World. The young woman who worked as a secretary told the jury at the international competition that she dreams of «getting married and staying at home». While in England for the competition, Leila said that she is dying to «see the Buckingham Palace» and meet «the Queen and John Mills», a famous English actor. 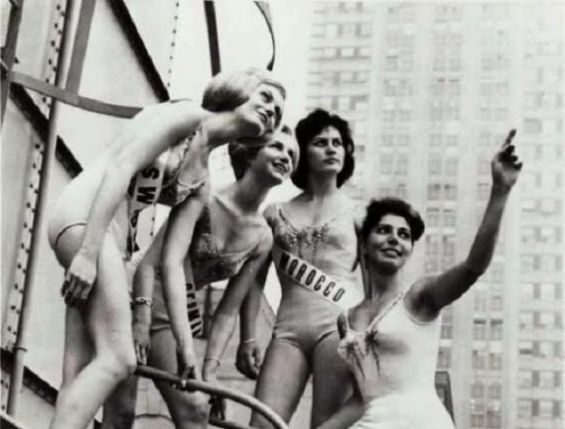 Lucette Garcia and Naima Naim participated in the same beauty contest in 1965 and 1966, respectively. 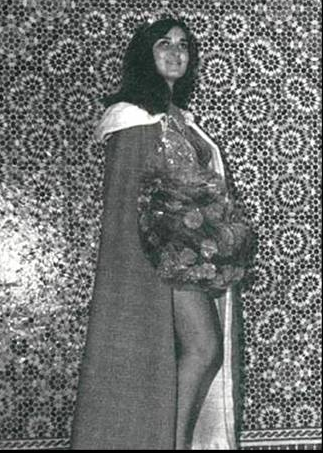 The 1967 edition of Miss World was marked by the participation of Naima Benjelloun, a 17-year-old student from Casablanca. According to the Miss World’s website, the young Moroccan woman «lists her hobbies as modern music, dancing, the cinema, television and languages». «This is her first visit to England, and whilst here she would like to meet the Beatles. Her ambition is to become an air hostess», wrote the same source, which kept record of Naima’s brief, yet interesting biography. Zakia Chamouch, who is the last Miss Morocco on the list, made it to Miss World in 1968. The 17-year-old Casablanca-native told the jury that while in England «she would like to visit the zoo and (see) the Changing of the Guard at Buckingham Palace». Miss World was not the only international beauty contest that attracted Moroccan beauties in the 50s, 60s and 70s. Since 1953, nine women were selected to represent Morocco at Miss Universe, an annual international beauty pageant that is run by the American based Miss Universe Organization. Jacqueline Dorella Bonilla, named Miss Morocco in 1957, was one of the most famous Moroccan competitors to ever make it to the American beauty contest. Indeed, Jacqueline ended as one of the top 15 semifinalists in the competition. On the internet, an old video of the competition shows Jacqueline presenting herself in front of the Miss Universe jury in Long Beach, California. Speaking in French, Jacqueline started her speech by inviting people who have never been to Morocco to visit the country. To the young woman, the Kingdom was quite modern in the 50s. «You can find in Morocco 15-storey buildings and luxury cars», she told the audience while laughing. Not very used to public speaking, Jacqueline started laughing in teh middle of her speech after a very embarrassing «slip of the tongue». Miss International was also one of the biggest beauty competitions that saw the participation of Moroccan women. Raymonde Valle was one of the first Moroccan beauties to represent the country in the Tokyo-based contest. It was in 1960 that Raymonde was selected to compete for the title. However, a weird yet funny anecdote marked her participation. According to Oocities, the young woman was quite embarrassed during the parade organized by Miss International. «One lady, though, had a bit of trouble with her national costume. It seems that Miss Morocco, Raymonde Valle, was missing her costume from her luggage», the platform recalled. In fact, Raymonde lost her dress while traveling and she had to use a sheet instead, which put her in an embarrassing situation. «Once the sheet was draped on her, it was apparent it was too skimpy and see-through, so TWA got another sheet to wrap around her», the same source wrote, adding : «Poor Miss Morocco would suffer another peek-a-boo scandal later in the pageant».